GREEN BAY, Wis. — The only thing left for Mike McCarthy to do is officially name Jamaal Williams his starting running back. Everything he has done and everything he has said indicate that the second-year pro will be the No. 1 back when the Green Bay Packers open the regular season on Sept. 9 against the Chicago Bears. What happened to that running-back-by-committee approach the Packers coach suggested all offseason? Don’t forget, he left himself an out during an interview with ESPN back in June. “But if one of them would emerge as that full-time guy, then you have to have that ability to adjust to that,” he said at the time. With all but one training camp practice completed and half the preseason schedule in the books, McCarthy might be ready to use that out, thanks to Williams. With that, fantasy football fanatics might have been re-ordering the running backs on their draft board. Those scared off by the running-back-by-committee approach might reconsider Williams. Williams ended last season as the Packers’ No. 1 running back, though his 556-yard total ranked just 36th in the NFL and left him behind two quarterbacks: Cam Newton (23rd with 754 yards) and Russell Wilson (34th with 586). His 3.63-yard average was higher than that of only four backs who ranked in the top 35. There’s reason to think Williams will be more productive this season. Last season, Williams outlasted Ty Montgomery, who ended the season on injured reserve because of wrist surgery, and fellow rookie Aaron Jones, who twice sustained MCL sprains. “Jamaal was a heckuva player last year for us as a rookie, and now he’s just so comfortable,” McCarthy said. “He’s so consistent, and like most rookies that go through an offseason, he’s had a chance to catch his breath. The Packers got a scare last week, when Williams limped off the field with an apparent right ankle injury. He blamed Steelers linebacker Vince Williams for what he deemed a dirty play, but he avoided a serious injury. In fact, he was back on the practice field this week. Jones missed most of the first three weeks of training camp — plus the first two preseason games — because of a hamstring injury. 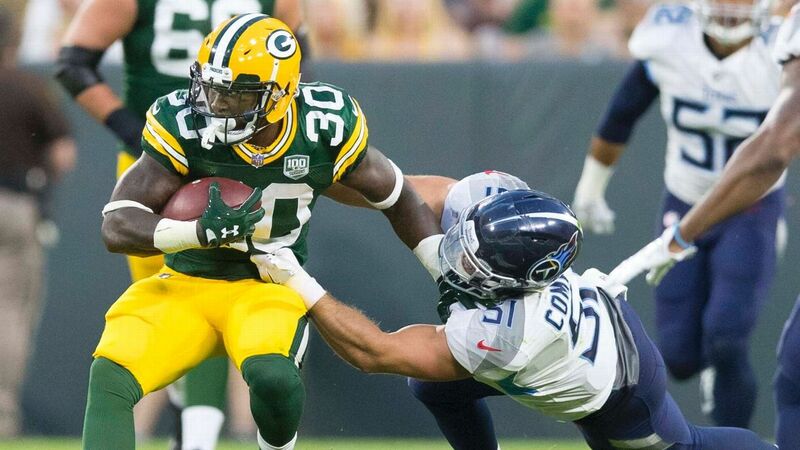 He might be the most explosive of the Packers’ top three backs, but his early injury history and the two-game suspension (for violating the NFL’s substance-abuse policy) he must serve to start the season have impacted his availability. Availability issues also have plagued Montgomery throughout his career, though he hasn’t missed a practice this summer. All three bring something different to the Packers, which explains why McCarthy initially leaned toward the committee approach, but the early reviews on Williams suggest that he is the No. 1 not only because he can run but also based on what he can do in the passing game as a receiver and blocker. “I really like his versatility,” offensive coordinator Joe Philbin said. “I think he can run the ball inside, he can run the ball outside, he appears to have a good blend of some power and strength, and he’s got some shake in his body — not just his dancing skills, which are renowned, I guess. And you know, he can pass protect. There’s pictures of him in camp stepping up and picking up the blitz, a picture in the game last week where he can catch the ball in the flat and make somebody miss and run with good pad level.